Bob Flowerdew might just be a legend in his home country of England. His books are very popular in New Zealand, even though we don't know him as a personality. 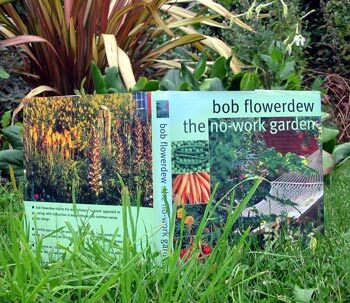 Bob Flowerdew, photographs by Jerry Harpur, illustrations by Kate Simunek. What an inspiring chap Bob Flowerdew is. He often makes me laugh out loud. Whenever one of his books appears in my book club lists I want to get it. This particular book of his, the No-Work Garden, fascinates me - whenever I re-read it, the text seems full of fresh wisdom. He is funny and sensible at the same time. New Zealand doesn't really have any garden celebrity writers like Bob. My impressions of him always include the long plaited hair hanging down his back, a beaming smile, his love of organics and growing fruit crops. Bob Flowerdew is an artistic writer - and I believe he also writes poetry? I guess he must get tired of meeting old lady gardeners who want his autograph - that's a pity!